Pokemon is about the adventures of Ash, Misty and Brock, three children who live in a world where Pokemon monsters serve their masters. Ash wants to become a Pokemon master. He tries to win badges to accomplish this goal. In order to do this, his Pokemon must win battles against other Pokemon which have been trained by other trainers. 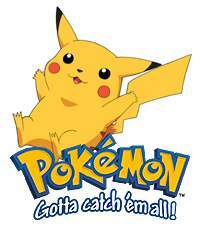 There are 155 varieties of Pokemon. Each has strengths and weaknesses. Ash owns a Pokemon named Pikachu, who looks like a harmless baby pig. However, Pikachu has an electrified tail, which is shaped like a Z. If Pikachu is faced with an enemy in the water, Pikachu can win the battle simply by electrifying his opponent. Ash is 11 years old and is the main character. He is constantly seeking out new adventures and trying to win more badges. He is joined by Misty, age 12, a beautiful red-haired girl who has a knot of hair sticking out the side of her head. They are joined by Brock, who is 13 and accompanies Ash and Misty. Brock is a Pokemon breeder and takes care of injured Pokemon. Their perpetual opponents are "Team Rocket", the bad guys in the show. Team Rocket consists of a girl, Jesse, a boy, James, and a cat, Meowth. In spite of the fact that Team Rocket is reviled and even hated by most of the children who watch this series, they have admirable qualities. They are a real team. They always work together and try their best to defeat Ash, Misty and Brock. They are always defeated and never win, and yet they come back and try and try again. Their cat, Meowth, is an independent thinker who does not merely obey the orders of his master the way that Pikachu does. A typical plot goes like this: All the Pokemon trainers are notified that they must bring their Pokemon to the Pokemon center for a medical checkup. All of the many trainers bring in their Pokemon. However, it is just a trick. When all the Pokemon are assembled at the center, Team Rocket throws a net around the Pokemon, throws them into a van and takes off. Ash, Misty and Brock take off after the van and, in Clint Eastwood style, catches up, commandeers the van, and frees all the Pokemon. Team Rocket is defeated once again. Laudable goals all. They are united, whereas Ash and Misty often feud and engage in petty disputes. All the Pokemon, except for the wild Pokemon who live in the forest, are transported in small balls which can be carried in the pocket. They are activated when the master throws the ball. When Ash throws the ball, he says "I Choose You." Later, the master can call the Pokemon back into the ball. Each of the Pokémon can only say one word: Their own name. For example, Pikachu can only say the word "Pikachu", or parts of that word. The exceptions are Meowth, who can talk and think as well as any human, and Mewtwo, who is another cat. There are other characters who come and go. There is a girl police officer, Officer Jennie, a girl nurse, Nurse Joy, and several other girls, all of whom look alike. All of the girls wear incredibly short skirts. The only girl who keeps herself mostly covered up is Jesse. The series features fast action. There is incredible pseudo-violence. The characters often seem to have been killed or seriously injured, but they always emerge unharmed. Nobody ever gets permanently killed. PS I could do a better job of explaining this if I were ten years old again. The official website for the Pokémon trading card game! Pokemon is evil and was sent to this planet under direct orders from Satan himself. Lots and Lots of Pokemon Lyrics! Pokemon: Vol. 1 - I Choose You! Pikachu!